Leonardo Da Vinci, the ingenious artist, scientist and inventor said "One day the world will look upon research upon animals as it now looks upon research on human beings." I think this is a Truth whose time has come; don’t you? I’m with Mark Twain…I believe that nothing good could come from harming other animals; and that includes toxicology testing on animals for cosmetics, pharmaceuticals, cleaners, or for medical research. On the rare emergency occasion, I have opted for using pharmaceuticals; particularly for dogs in my care. 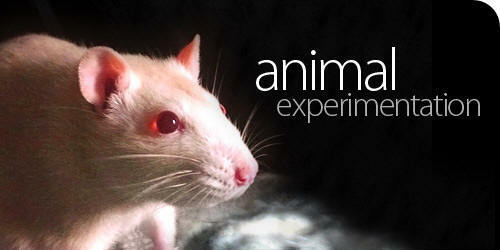 Otherwise I’ve made certain that I was not a part of the demand for animal experimentation. There’s no way to get around the speciesism that is tied to pharmaceuticals; other animals die in horrific experiments to allegedly benefit humanity and their chosen companion animals. Frontline Plus; flea and tick control, for example, may help to control our furry friend’s fleas, but many other animals had to die to test this product. Its main ingredient is Fipronil which has been tested on countless animals; using a test that administers a dose that kills 50% of the animals involved in the study - and I suspect that many laboratory test subjects (unwanted dogs and cats) were killed in order to test the finished Frontline Plus product. Is it morally acceptable to experiment on nonhuman animals to benefit human beings or a favored species of animal? We can compare the case of testing on animals to the Tuskegee syphilis case. Knowledge about syphilis was learned, but they did so by violating the fundamental rights of someone who is sentient. Just as racism allowed the Tuskegee syphilis experiment or the Nazi human medical experiments -- speciesism accepts animal experimentation. Being human, you will probably better relate to the Tuskegee experiment or Nazi experiments as an example that makes the point that “the ends does not justify the means”. If we asked animals used in experiments – they would also tell us that the end does not justify what humans do to them. Every animal; human or nonhuman, inherently has the right not to be harmed by humans, and that basic right is violated by most of human society. The whole of human consciousness is waking up to this viewpoint as is evidenced by the progress being made in the last decades. Preventative health measures are an alternative to relying so heavily on pharmaceuticals; which are tested on animals for toxicity. Eating a healthy whole foods diet, getting moderate sun exposure, fresh-air exercise, and using healing herbals and nutraceuticals - is a path to follow that leads one away from pharmaceuticals. 'Cruelty-free' is a term that means the product is not tested on animals. There are now cruelty-free cleaning products and cosmetics widely available, especially in natural food stores. We simply need to stop demanding animal toxicology tests by purchasing products that have not been tested on animals nor do they contain animal-derived ingredients. It’s not as hard as it sounds…but I remember a time, three decades ago, when it was! There are many ethical products now being marketed; showing that there is concern about the issue. Moving humanity towards veganism is the answer. It’s always the answer. People eat a diet that kills billions of animals and causes diseases that we then try to find cures for by cruelly testing on billions more animals. A whole new paradigm in living and thinking is needed. I have been vegan for 33 years and have rarely needed to use products that were tested on animals; there is another way. We need to use humans as the “guinea pigs” in an experiment entitled “What would happen if humanity adopted veganism?” Extrapolating from the microcosm of the present vegan community; human health would see vast improvements, and diseases presently afflicting humans would vanish - and nobody gets hurt in this experiment. There has been progress in finding alternatives to animal testing and if we put our brilliant minds to it, we will find more alternatives. If other animals are so unlike humans that we feel we can inflict misery on them, then why would we think they’re similar enough to extrapolate findings from them to humans? Animal physiology is different between the different species. If they’re enough like us that we can extrapolate findings from studying them to humans, then we can see that they, like us, have sense perception, and therefore we should obviously behave towards them as we would want them to behave towards us; with respect and basic decency. That would leave out using them as a resource, a commodity, a means to an end, as well as killing them. Every animal is a soul that just wants to live his/her life. Animals commonly used are mice, rats, guinea pigs, hamsters, gerbils, fish, and amphibians. Rabbits are used in eye irritancy tests because they have less tear flow, and are also used for the production of polyclonal antibodies. Cats are most commonly used in neurological research. Dogs are widely used in biomedical research, testing, and education; especially beagles, because they are easy to handle. Dogs are commonly used as models for human diseases in cardiology, endocrinology, and bone and joint studies; research that is often highly invasive. Non-human primates are used in toxicology tests, studies of AIDS and hepatitis, studies of neurology, behavior and cognition, reproduction, genetics, and in transplantation research. They are caught in the wild or purpose-bred. To the non-speciesist person, no animal of any species should be used in animal experimentation; with the exception of a consenting human. A great number of drugs that have been approved in both the U.S. and U.K. after animal testing, subsequently have had to be withdrawn because they have caused serious side-effects or death when given to people. Animal experiments can be unreliable because animals’ bodies are different from ours. Thousands of chimpanzees have been used in useless experiments to find a cure for AIDS, but it is now known that AIDS won't kill chimpanzees. The link between smoking and lung cancer was first observed in people, but because no animals developed cancer when forced to inhale tobacco smoke, human health warnings were overdue by many years. Animal experiments give us misleading information because other animals don’t necessarily get the same diseases as we do. Also drugs affect other animals differently. A drug such as aspirin, commonly used by people, is highly poisonous to cats, for example. Leonardo Da Vinci, the ingenious artist, scientist and inventor said One day the world will look upon research upon animals as it now looks upon research on human beings. I think this is a Truth whose time has come; don’t you?